A beautiful modern home called the Rutherford House is located in Taupo Tauranga/Oruatua, New Zealand. It is designed with four main elements comprised of a concrete base, which at some points is folded up to contain interior spaces, two black cedar-clad bedroom blocks, and an open-plan white structured ‘veranda’. It is a modern holiday house that is perfect for both hot summers of Lake Taupo and cold winters for skiing on Mt. Ruapehu. 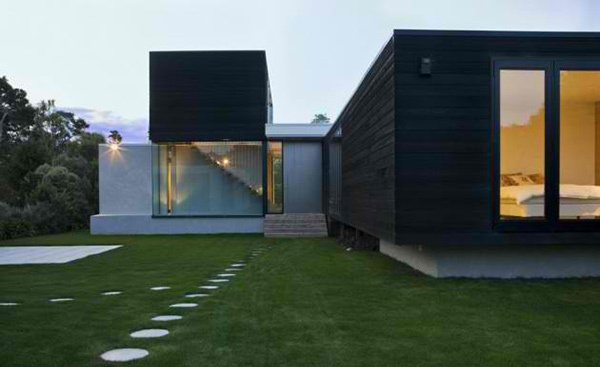 The look of the house both inside and out is perfectly amazing especially with its geometric lines in it. 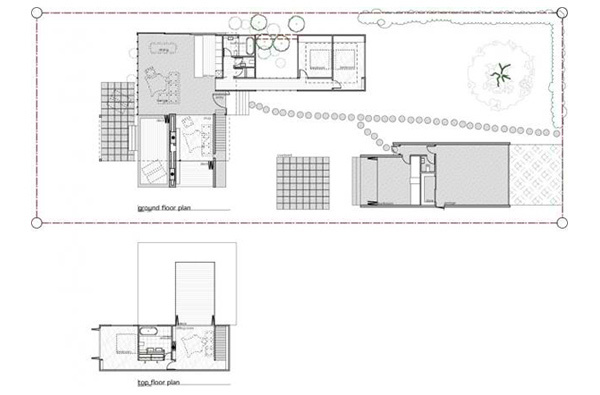 Thermal mass floor and walls including passive ventilation is featured in the internal environment of the house. It has also an additional heating in both indoor and outdoor spaces provided by open fires. A large open plan veranda comprise of the kitchen, lounge and dining areas while on the top-floor is a private sitting room. The facade of the house may look familiar and similar to other modern homes but actually this has a different style and layout. The cantilevered upper level of the house give more appeal to its design. Glass walls from floor to ceiling give transparency allowing us to take a peep of its splendid interior. 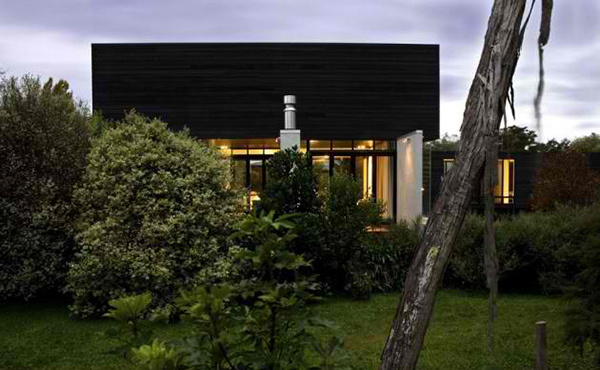 We are not sure of the exterior materials used for this house but the black sidings and concrete combo is a win! Using bean bags for this area makes chatting a lot more fun. You can also see the dining area here with black drum pendant lights suspended from the ceiling. You will notice that glass is used for this area of the house lending it an airy and cozy aura. 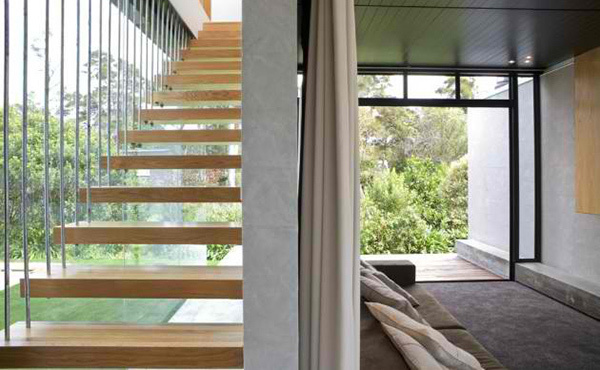 Floating stairs are commonly used for modern homes which is also adapted in this house. The house is surrounded by nature’s beauty which plays as an outdoor accessory for it. The elevation of the house is reflected in this image. What you see here is the floor plan of the house. 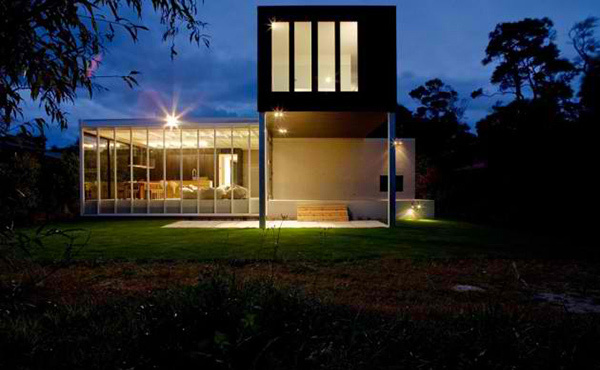 The Dorrington Architects successfully designed this modern house with a distinct style. They further described that it has a “concrete base that provides the required floor level rise, creating intermediate zones between inside and outside. Raised decks from both the living room and snug articulate elevated, and in the case of the front deck, covered outdoor spaces. The living space arrangement suits the extreme climates of the location, activities and varying degrees of privacy.” What can you say about the Rutherford House?